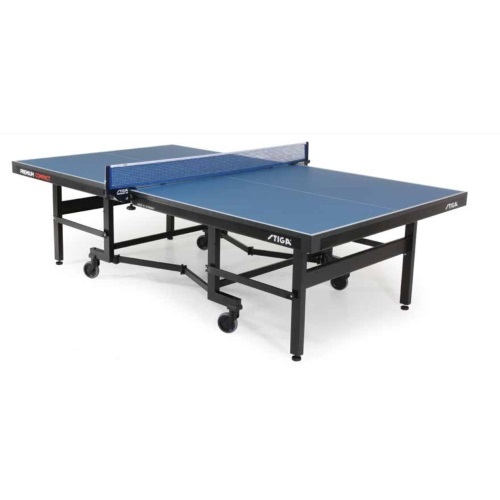 Get the optimal table tennis playing experience with the T8513 Premium Compact table from Stiga. This table features an ultra, heavy-duty chassis, a thick and sturdy playing surface, regulation dimensions, and roller casters to position the table where needed. When not in use, the T8513 conveniently folds up into a compact storage position to free up space in your game room. Order your Stiga tables here. 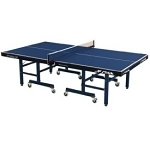 This table tennis game table comes with a 1-year warranty from Escalade Sports. The ultimate in table design, safety, convenience, & world class playability. Super Compact System folds to minimal storage dimensions and comes fully assembled. Commercial grade pistons assist with opening and closing of the table, which can be done by only one person, in one motion. Solid, heavy-duty chassis supports the thickest top available. Includes: Premium VM Net & Post Set. Assembled weight: about 300 lbs. Assembled, unfolded dimensions: 108 inches L x 60 inches W x 30 inches H.
Folded up, storage position dimensions: 60 inches W x 30 inches D x 62 inches H.
This Stiga table tennis table ships from the warehouse in San Diego, California via an ltl carrier for a curbside delivery. This type of delivery requires the customer to be present to sign for the shipment and to move the product wherever needed on the delivery property. The driver will not assist with moving the product so please plan to have sufficient help to take the product off the truck and onto the property where needed. Delivery appointments are scheduled through the freight company before delivery is attempted. You can either wait for the freight company to reach to schedule the appointment, or you can contact the freight company, once you have the tracking number for the shipment, to schedule the appointment directly. - 311 lbs, 70 inches x 62 inches x 22.5 inches. Dimensions: 70" x 62" x 23"